Inspired by Maya’s carrot cake oats, I decided to branch out from my usual Bircher Muesli recipe and tried a few new things. First, I soaked the oats in soy milk instead of water and I skipped the whole almonds. In the morning, I added a grated carrot along with the usual grated apple, plus some extra cinnamon. Finally, I topped the lot with toasted sliced almonds. I wouldn’t call it “carrot cake”, for lack of cream cheese frosting, but I loved it, especially the crunchy texture of the carrot. Highly recommended. Soak the oats, raisins, flax seeds and cinnamon in the soy milk overnight (add enough soymilk to cover the oats). In the morning, mix in the apple, carrot and lemon juice. 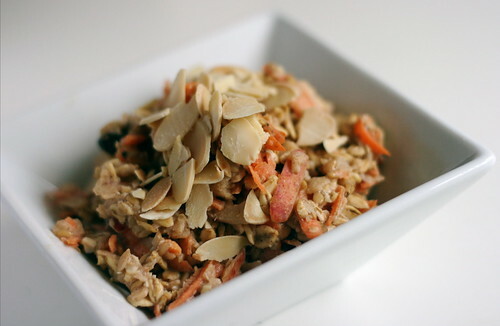 Top with slivered almonds and serve. Serves 2. 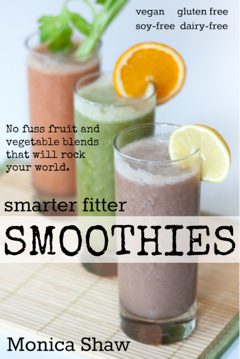 I’ve been taking some of your suggestions and mixing up my smoothies with other fruit besides banana. I really like the strawberry and banana combo. Tomorrow I might try adding some mint. 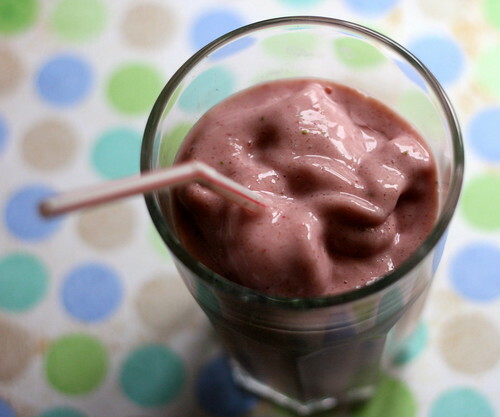 Whizz it all up in a blender. Pour into a glass and enjoy. Serves 1. I’ve been craving a grilled portabella mushroom sandwich, so on the way back from our walk, I picked up a baguette from The Spence then headed home for some hot grillin’ action. First I put some portabella mushrooms, sliced red onions and sliced red pepper into a big ziplock bag. Then I added a little bit of balsamic vinaigrette, fresh parsley, salt and pepper to the bag and mixed it all around. 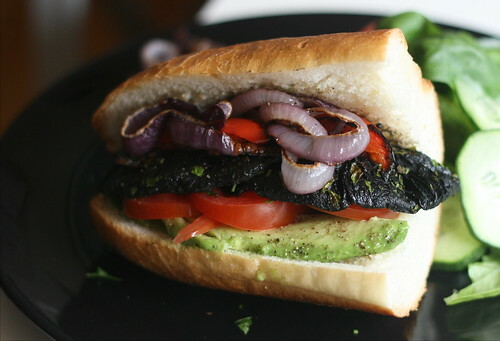 Then I grilled the veggies in the oven and stuffed them into the baguette along with some avo and tomato. It was perfect! Another hit from How to Cook Everything Vegetarian. Bittman’s Braised Lentils, Spanish Style are delicious and easy (that is, if you happen to have red wine, smoked paprika, and saffron around). I also tried a new recipe for Swiss Chard from the New York Times: Swiss Chard with Currants and Pine Nuts. I used walnuts and sultanas instead of pine nuts and currants, and it turned out great. It’s amazing how the addition of just a small amount of rich nuts and sweet sultanans can turn boring greens into something exciting. To me, this is the heart of vegan cooking: learning how to make vegetables taste good (rather than learning how to make vegetables taste like meat!). YUM! i love your carrot oats! so glad you tried it 🙂 love the addition of the grated apple! i must try this recipe. You could totally make the yogurt cheese frosting from Tosca Reno’s Eat Clean cookbook for the oats! 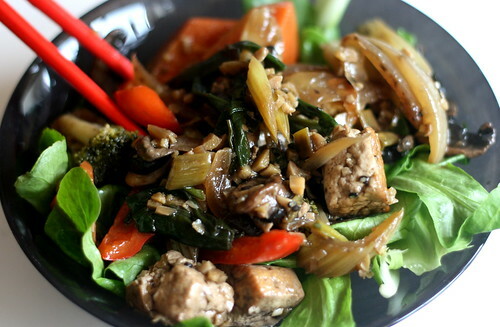 Love your idea for the stir fry on the salad. I’ve only ever tried a portabello mushroom once and wasn’t keen on it, but maybe that’s because of the way it was prepared? I should try it again… thanks for all the great vegan recipes. I can’t tell you how grateful I am for this post ~ it’s almost impossible to find appetizing vegan recipes that are calorie-counted, and as someone who needs to keep an eye on such things it’s wonderful to see gorgeous food such as the carrot cake oats and smoothie already pre-portioned and analysed. 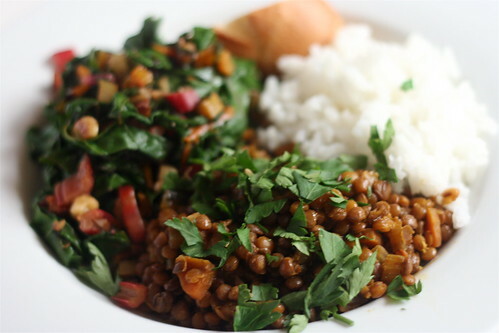 Love the blog, and keep the yummy meals (and recipes/calorie counts) coming! @maya – the carrot oats were AWESOME. i wasn’t going to do the apple but it seemed a little dry without. turned out to be a winner – let me know what you think. @sagan – i am going to look up this recipe you mentioned. it sounds interesting! as for the portobellos, it could have everything to do with preparation. i think they need something beyond salt and pepper… they’re very good marinated in soy, ginger and garlic. but it could be the texture – i know some people who can’t bare it.